Cover crops have been used for decades and their use in “permanent” agriculture, such as vineyards, has expanded significantly in recent years. It is probable that the majority of vineyards in the state are now using them to some extent. Despite their widespread use, most growers do not utilize them in a permanent manner. Many elect to plant them on an ongoing, yearly basis and then incorporate them into the soil by means of cultivation in order to increase organic matter and/or nitrogen levels. While this practice is certainly beneficial, it fails to fully take advantage of all of the benefits of cover crops. From a “carbon footprint” perspective, it arguably takes more carbon to implement then one receives as a benefit. Monterey Pacific, our farming company, manages 7,300 acres of vineyards in Monterey County, all of which are farmed with permanent cover. Our cover crop system is unique in that the process and its numerous benefits were discovered by serendipity. Doesn’t it always seem that the most elegant and robust solutions are discovered in this manner! I will endeavor to take you thru this process of discovery to hopefully demonstrate the beneficial subtleties of this unique sustainable system. In 1985, while farming a hillside vineyard, in the Santa Lucia Highlands that contained permanent cover crop for erosion control, I asked myself: Why is this volunteer cover crop comprised entirely of native grasses, while the seeded cover crop I was trying to establish in a vineyard down on the valley floor was full of undesirable broadleaf weeds? Harry Agamalian, the local UC Extension weed expert, pointed out that broad leaf weeds will not germinate in the shade. I decided to reduce the number of times I mowed the cover crop in order to provide more shade to inhibit the germination of broadleaf weeds. However, we still mowed at least three times a year (spring, summer and fall) like most growers to keep things neat and tidy. Then, in the spring of 1994, while mowing a Merlot block, we needed to reassign the tractor to catch up on our mildew spray program after a storm had come through. Consequently, only half of the Merlot block was mowed while the other half was not. When we returned to finish the mowing three weeks later, we discovered that the vines in the portion of the block where we had not mowed had 4-5 inches more shoot growth than the section we had mowed. Here in Monterey County with our infamous wind and super- long growing season, anything you can do to speed up the process -especially with young vines -is important. 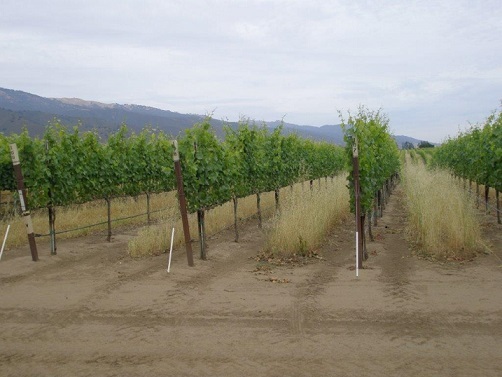 Additionally, this discovery inferred that the cover crop had affected the vineyard microclimate by reducing the wind velocity, thereby increasing the ambient air temperature within the vineyard. This is an important discovery in an area that oftentimes could use more heat. Over the intervening years we have learned that cover crops: reduce dust and erosion, increase ambient air temperature, reduce soil compaction by increasing soil tilth, increase organic matter, and provide an environment for beneficial insects. Additionally, recent research has shown permanent cover crops increase soil populations of Mycrorizhi and other beneficial bacteria and fungi, which are extremely important to overall plant health and well being. So how do we establish and manage this cover crop to maximize its benefits and sustainability? When we establish a new vineyard in previously unfarmed, virgin pasture land, we don’t need to plant a cover crop as there is already sufficient seed in the soil and surrounding vegetation to inoculate the entire block without assistance. Certainly, this is the most desirable establishment scenario. However, in a previously cropped site, especially row crops, we need to provide some assistance. At previously cropped sites, for the first year we plant Merced Rye every other row within the block. We selected this perennial based on Australian research that showed this cultivar could provide a beneficial allopathic property (reduce the germination of other grasses and broad leafs in close proximity) to possibly reduce weed control costs during the establishment phase. We use a band of contact herbicides down each vine row during the growing season to protect young vines from weed competition while establishing cover crop. We do not mow this cover crop until late July or early August to ensure the seeds are properly mature allowing them to germinate next winter and reestablish a cover crop the next year. We plant the “other” row the following year to complete the establishment process. In order to fully mature the seed AND to prevent the cover crop from competing with the vine for precious soil moisture in a very arid region (less than 14 inches of rain annually), it is extremely important not to mow this cover crop before the “boot stage” of growth (when the seed head first emerges) in April/May. Mowing before the boot stage is what we do when we mow our lawns at home. The grass will continue to grow and utilize water. If you wait until after the boot stage, the perennial will not grow any longer and will not compete with vines for water. Grass cover crop systems are also “drought obligate” – if they do not receive irrigation or rainfall prior to the boot stage, they will dry out and turn brown. But just like your lawn, once water is reapplied, it turns green again. Drought obligate cover crops will not re-grow when additional water is applied after the boot stage. Another aspect of certain grass cover crops that one needs to understand in this system of sustainability is the term “daylight obligate.” Once the day achieves a certain length (May/June), the mature seeds will not germinate until the days shorten in the fall. This mechanism ensures that seeds in this arid environment will not germinate during the summer when there won’t be any rainfall to sustain them. Additionally, this mechanism guarantees that our cover crop will not grow adjacent to vines that are receiving drip irrigation during this timeframe. Over a period of 4-6 years, the native grasses in the area will repopulate vineyards farmed under this system resulting in a grass culture not unlike those we see on the gently rolling hills throughout the Central Coast. The native grasses grow to a perfect height, generally 2 to 2.5 feet, and provide all of the benefits that a grower could ask for in a sustainable crop culture. As you can see, there is a much more to cover crops than meets the eye!